Don't give a second look to packaged guacamole -- crushing an avocado yourself is a task any home chef can master. The resulting mash is fresh, creamy and ready to use in dips, sides and entrees. Learning to crush an avocado gives you a new way to use this fruit in meals -- and considering that avocados are flavorful and packed with heart-healthy fats, fiber and vitamins, you should. Transforming a whole avocado into smooth, crushed flesh takes just a minute or two, but navigating the necessary knife work requires some caution. Wash the avocado under running water. Set it on a cutting board or clean dish towel. Hold the avocado in place by lightly pressing down on its top with one hand. Slice into the side of the fruit with a sharp knife, pressing in until the knife hits the hard pit. Slice all the way around the avocado lengthwise, keeping the knife pressed against the pit, to cut it into two halves. Twist the halves apart. The pit should remain anchored in one half. Try slipping a spoon between the flesh and pit; if that doesn't loosen the pit, turn the half over and slice it into quarters. Pull the pit away from the flesh and discard it. Hold each piece of avocado in your palm. Slide a spoon between the flesh and the skin, scooping the flesh out and placing it in a bowl. You may also be able to peel the skin away from the flesh, if the avocado is ripe enough. Remove any black or brown spots with your spoon. Discard the skin. Crush the flesh by pressing it with a fork or potato masher until you've achieved your desired consistency. Puree the avocado in a blender if you prefer a completely smooth texture. Spread the crushed avocado on toast, use it to top pasta or salad, mix it with onion, garlic, lime juice and salt to make guacamole or freeze it to be used later. Not all avocados are ready to be crushed. An under-ripe avocado won't mash or taste the way you want it to, and overly ripe fruit has rotten spots and an unpleasant taste. Take these tips from the Hass Avocado Board when searching out the perfect avocados: Look for pieces with dark, smooth skin free of blemishes. Squeeze each avocado in your palm. A ripe, ready-to-eat one will give slightly in your hand without feeling mushy. If you're not planning to use your avocados for a few days, pick fruit that has green skin and doesn't give when you squeeze it. Store the avocados in a sealed paper bag until you're ready to prepare them. 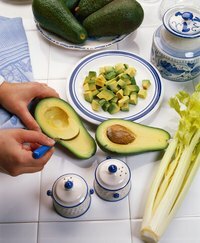 You may have seen a chef remove an avocado pit by slamming a knife into it, twisting the knife and pulling the pit off of the knife. Though this method looks impressive, it's needlessly dangerous. Stick with your spoon and fingers when removing the pit. Crushed avocado will brown quickly when it's exposed to air. Prepare it just before you want to eat it, or quickly pack it into an air-tight container to store in the fridge or freezer.